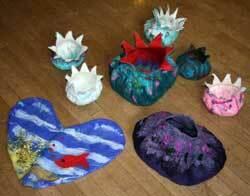 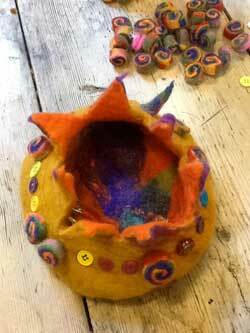 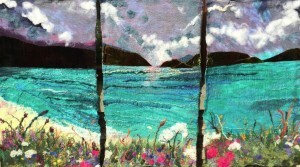 Felt Workshops with Debra Esterhuizen in Appleby, Cumbria. 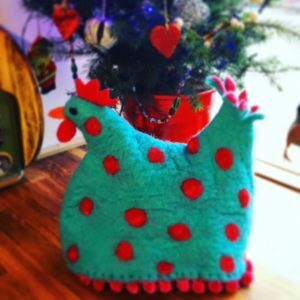 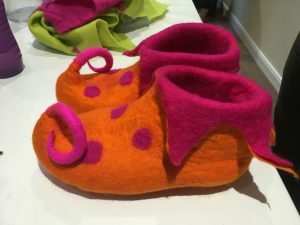 FELT ART on-line COURSE – £75 Study at your own pace in your own home- series of videos on all aspects of felt art – wet and dry. 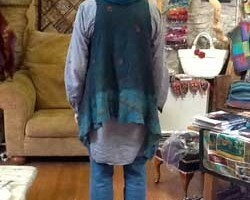 – click on this blue link below for more info. 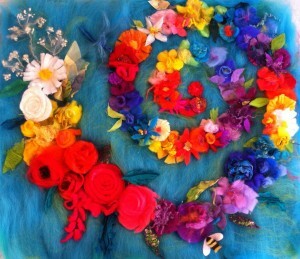 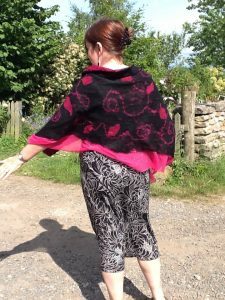 I loved this course… Debra is a very friendly, helpful, calm and wonderfully creative teacher. 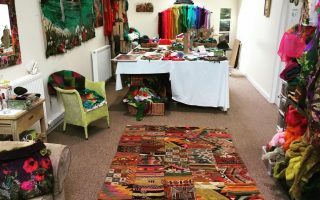 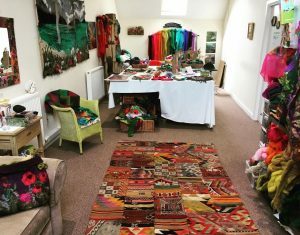 Her beautiful studio offers a wonderfully colourful and nourishing space in which time enjoy hours of crafting, with lots of materials and felts to choose from and explore. 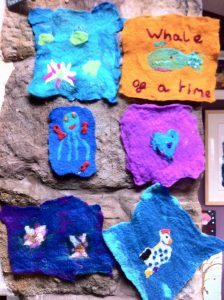 The Appleby Hub is a lovely community centre to discover, with delicious cake and lots of books to mull over in the lunch break. 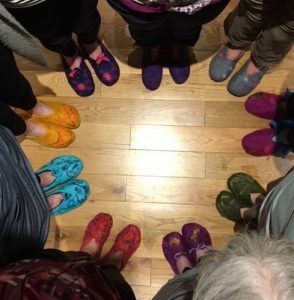 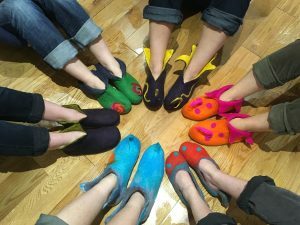 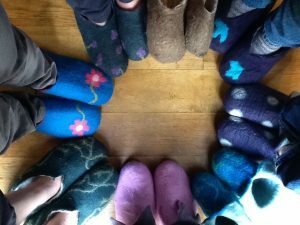 I highly recommend this class, not only for the slippers but for the pleasure of sharing time and ideas with a wonderful teacher in a creative studio. 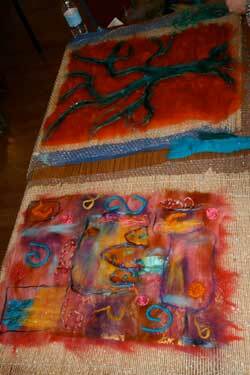 I’m now seeking further opportunities to felt and also go back for another course! 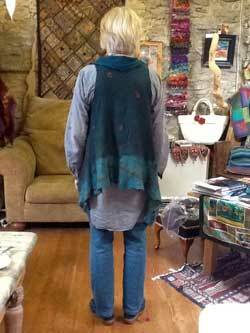 “Dear Debra, A Big Thank You for a wonderful workshop the other week making a Nuno Waistcoat. 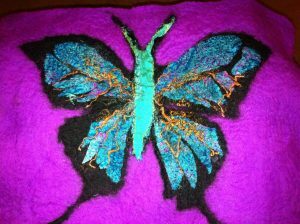 It was so inspiring and I love the result. 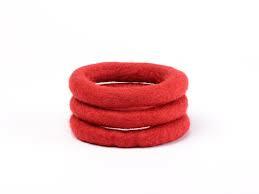 I have already worn it twice for special occasions and impressed family and friends and neighbours. 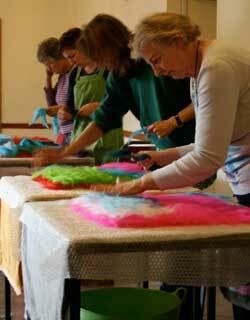 Your patience and generosity was amazing and I am looking forward to coming back to another workshop soon! 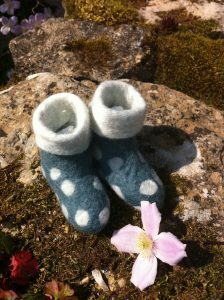 or call- 07817 378 388 to see if a date of your choice is available. 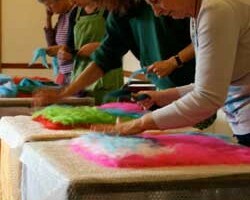 All classes are small , limited spaces. 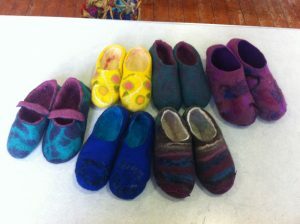 They can also be hand washed. 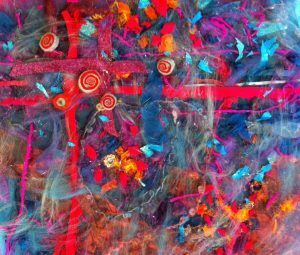 I have a fantastic array of colour, fibres and textures to add to your work . 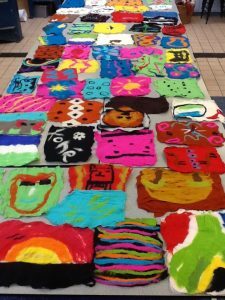 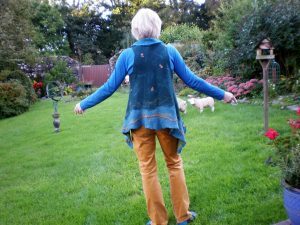 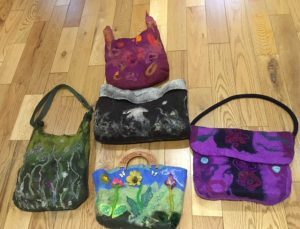 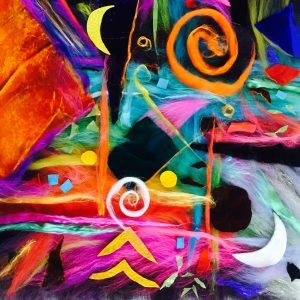 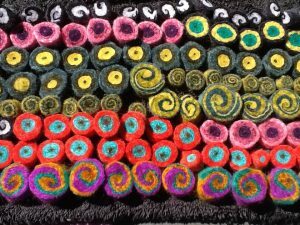 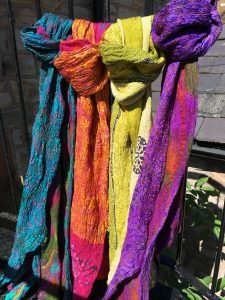 You will learn : brief history of felt making and you will make 2-3 beautiful, textural, colourful, abstract and landscape wet felted pieces of Art. 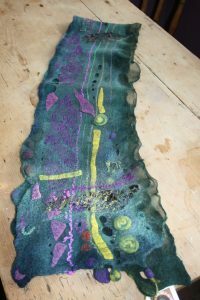 I will also talk about machine embelishments and needle felted details, mounting and framing techniques. 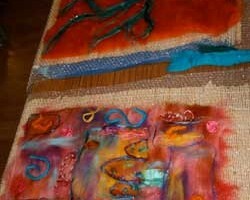 I have a fantastic array of colour, fibres and textures to add to your work . 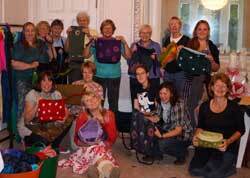 Extra charge for materials ( £10 ) Bring your own materials if you wish. 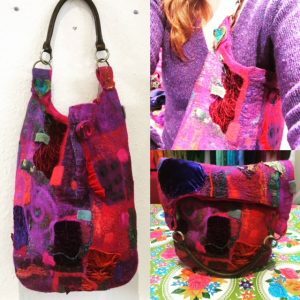 You will learn : how to make a beautiful shoulder bag /handbag or tea cosy , all without seams or sewing and with very strong handles which will last for years. 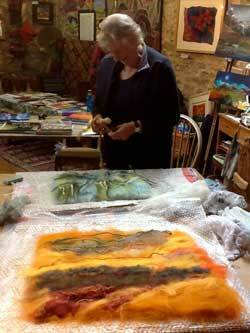 I have a fantastic array of colour, fibres and textures to add to your work . 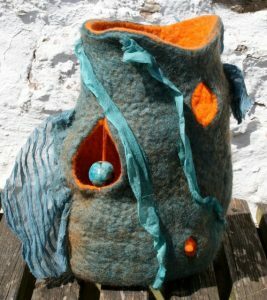 You will learn : how to use resists and make a vessel . 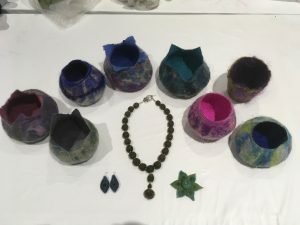 How to make bangles , beads and pendants. 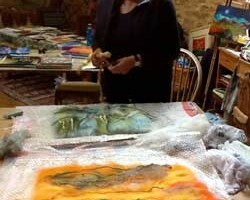 I have a fantastic array of colour, fibres and textures to add to your work . 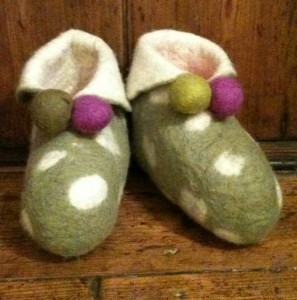 Extra charge for materials (approx £8). 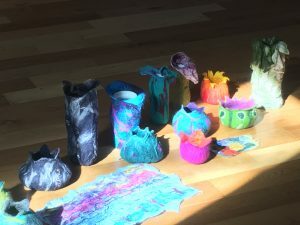 Bring your own materials if you wish. 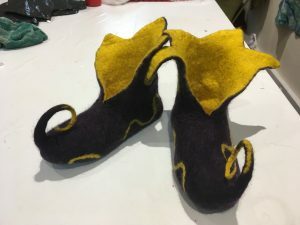 You will learn : brief history of felt making and nuno felting technique . 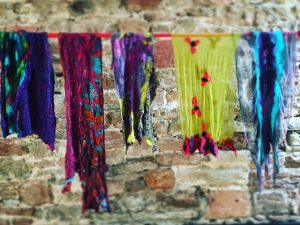 We will use beautiful coloured silks and chiffons with merino wool to produce stunning soft scarves, perfect for both summer and winter. 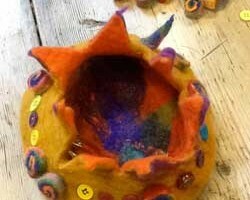 You will learn : brief history of felt making then you will learn how to create felt buttons, beads and bangles. 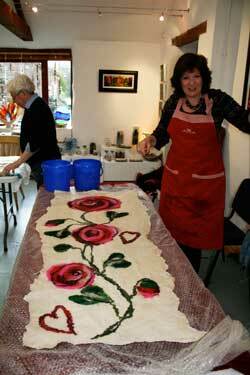 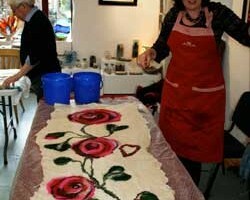 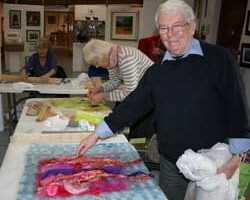 Come along in the school holidays and create beautiful pictures using silks and other fibres. I will show your children how easy this can be and will provide all the beautiful materials they could possibly need! 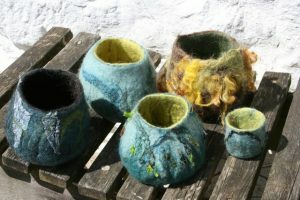 teas and coffees for parents down stairs if you fancy a break. 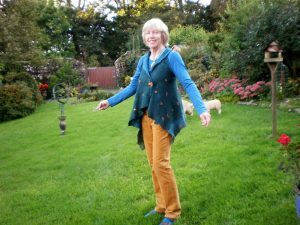 I am DBS checked and certified and I work regularly in schools.